💜jessica simpson shoes size 6💜. Condition is Pre-owned. Shipped with USPS Priority Mail. Shoes have been tried on but never worn. Vero Cuoio Shoes. Flaws -Left Shoe Has Two Cuts On Zipper Area. Made In Italy. EUR Size 36. Closed suede heel. Leather and suede lined with lightly padded leather insoles. 4 1/4" Polished heel height. Open inner side. I am not a professional photographer but I try my best, however, the color may not be the tone or hue of the item. 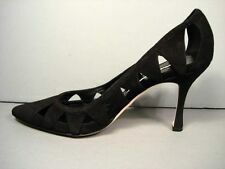 The Nine West Stefany Dress Shoes feature a Suede upper with a Pointed Toe. The Man-Made outsole lends lasting traction and wear. Non-Continental US. as soon as we receive. Brooklyn, NY 11212. 1669 Pitkin Avenue. Sporty nylon updates a smart, cap-toe flat finished with slim logo letters. Sizing: True to size. - Round cap toe - Bow detail - Contrasting nylon and patent leather construction - Slip-on - Lightly padded insole. 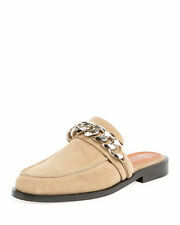 This is a beautiful pair of "Minetta" sandals by Cole Haan with Nike Air technology in a size 6 1/2. These have textured leather in a beige strap across the top of the foot, a gray ankle strap and buckle and a 4" black block heel. Designer/Label - B Makowsky "Isla". Style - Slingback Heels. Special Details - Buckle Closure, Open Toe, Platform, Minor Marks On Leather, Minor Wear On Soles And Insoles, Very Good Condition. Occasion - Casual.